I needed to see Dresden. The Stammtisch group I attend Tuesday nights in Eugene recommended I see it, for it is a beautiful rebuilt city. The beauty wasn’t the primary reason I went there, however, although I was not disappointed. The fact the city was rebuilt after the February 1945 firebombing did interest me. I expected to see a lot of memorials in the city. The only memorial I saw was outside of Frauen Kirche, on a piece of rubble. There was a plaque with a comment by a man who had walked through the “dead city” on 15 February 1944, witnessing the final collapse of the dome. 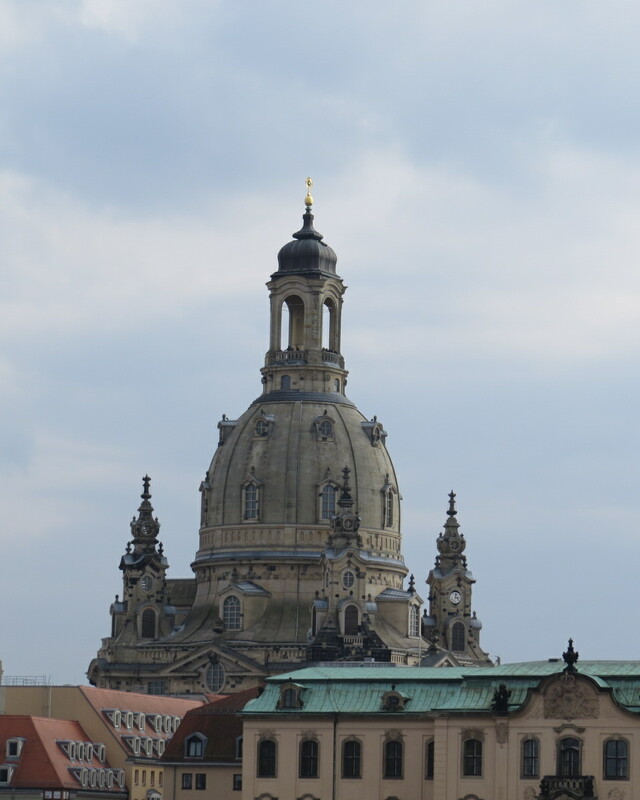 Those monuments is where I remove my hat, as I did when I went into the rebuilt Frauen Kirche. I am not religious, but I lit a candle and wrote in the guest book “Gedenke für die Opfern Februar 1945.” Dresden didn’t need to be bombed. I say that, not in hindsight, but because even before and during the raids, many Allies questioned the need to bomb it. Much industry was outside the city, a cultural center, and many fleeing the Soviet Army passed through Dresden. I walked throughout the new and old cities, and when my wife and I went to dinner the last night, I again looked up in the sky, as I had many times, and wondered what it must have been like the night of 13 February 1945, when there were so many bombers that when they were first spotted, it was described as a giant dog was about to swallow the city. It was worse than being swallowed. The city was burned to the ground. Here, 6685 bodies were cremated. Most of them had already been burned in the firestorm, so this was really a second, final cremation. The dogs of war had been let loose in the world, and war had returned with a vengeance. The people did not blame the Allies for bombing Dresden. The statement simply stated that war had begun here, had spread from here, and had come back here in spades. I needed to read that. It mattered that there was an acknowledgment of war. It mattered that the people actually wrote it on a monument, not without controversy, for there was some, but they did write it. Indeed, it matters as much as the fact that there was a resistance museum, for it is clear that people did protest what was happening. They were shouted down, attacked, deported and murdered. The lucky ones fled. I thought it ironic that a right-wing group had held a rally here the night before, including an American flag with “US go home” painted on it. Dresden had been shut down by demonstrations earlier in that month, and more were planned. The right wing wants its way; most of us do. The difference is I’m willing to look for solutions, willing to give, but not willing to always give in. The right wing I know has to have everything their way. The right wing in Germany forced their way in the 1930s, and almost brought down civilization. The right wing in the US had incredibly gone around the President’s back and told Iran that any deal negotiated by the US would be null and void after the next election. Had Congress done that to the prior president, they would have been labelled traitors. Additionally, inviting the Israeli prime minister to speak in front of Congress, and is coming, was a massive breach of protocol, torpedoes hopes of negotiation of Iran, frankly boorish, and incredibly stupid, since the senator who wrote this letter was later quoted as saying the Iranians were “in control of Tehran,” as if the capital of the country were somewhere else. I may not be a US Senator, but I know what and where Tehran is. I correspond with several people who live there or who have escaped from there to other countries. I find it astounding that a country where balancing the budget is given so much press and so little effort to do what could easily—yes, easily be done—is actually considering unleashing the dogs of war on a country three times the population and area of Iraq. We were told that war with Iraq would cost $1.7 billion and be paid for by oil revenues. To date, the cost has been one thousand times that. Yes, one thousand. Several thousand Americans have died, uncountable Iraqis, and tens of thousands of American soldiers maimed for life. The numbers of Iraqis are again uncountable. I don’t think we can prevent Iran from obtaining a nuclear weapon, and even if we could, the fact that nuclear material has been smuggled out of former Soviet republics, that Pakistan, India, China, Israel and North Korea are among those countries with nuclear weapons, to loose the dogs of war on Iran is beyond my comprehension. Elections matter. Too many Americans sat out the last one because Mr. Obama hadn’t fixed everything that the recession and two wars he inherited had caused. Further, Mr. Obama is faced with a rapidly changing world that America no longer can control with troops, CTF (that would be carrier task forces), or bombing. Further, he is being asked to cut spending, taxes, and destroy the environment in the name of jobs, which need to be different from ones we have had before, because the world is changing rapidly. It’s difficult to walk out of the Jewish Museum in Berlin without realizing that the world has been at war a good deal of its history with a few relatively short periods of peace. Peace in our time will sooner or later devolve into war. At least two thousand years of history support this contention. Unleashing the dogs of war immolated Dresden. It did the same to Tokyo, where fire killed more people than Hiroshima. The dogs of war, once unleashed, are not controllable. One might be extremely cautious before letting them loose. One might even visit Dresden. This entry was posted on March 21, 2015 at 11:57 and is filed under Uncategorized. You can follow any responses to this entry through the RSS 2.0 feed. You can leave a response, or trackback from your own site.